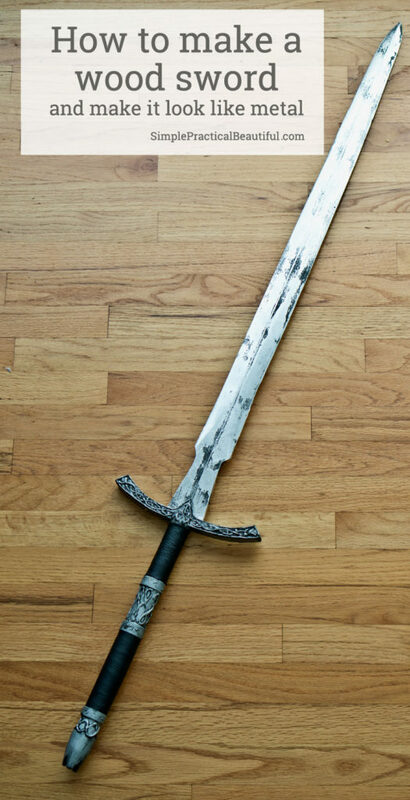 My husband needed a large sword for his Ringwraith costume, so he created a template to make a sword that matches The Lord of the Rings movie prop. 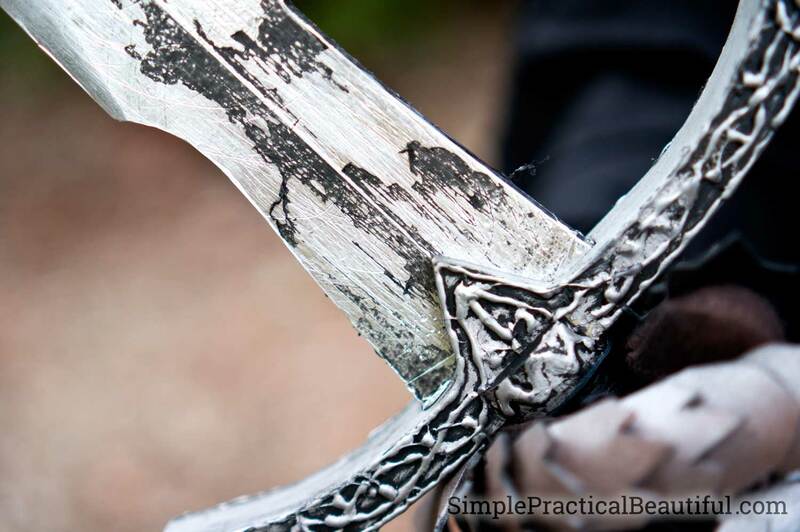 He used the Witch King’s sword for his pattern. 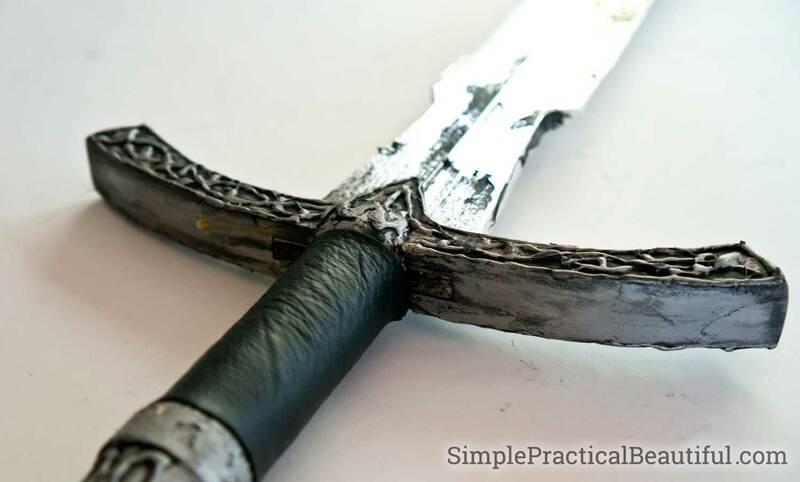 This sword pattern could be used to make a sword for any character or costume, so he’s sharing his free printable pattern and how he made his 4-foot sword. 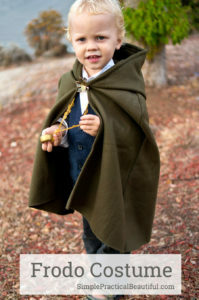 Our whole family dressed up as characters from The Lord of the Rings, so be sure to check out our costumes here. And the Nazgul gauntlets made of foam here. 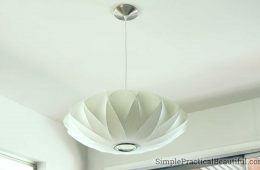 Plus, there’s a video on how to make a simple shield here. 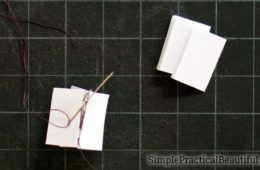 Print out the template and tape the parts together. This is a large sword, so it takes several pages to get the full length. 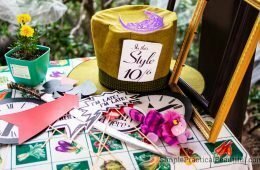 Cut out each of the pattern pieces, then tape the blade template together by matching letters. Cut the blade shape (2 inches x 40 inches) along the lines drawn on the blade. 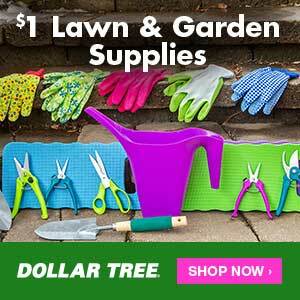 I used a bandsaw to cut out the shape. 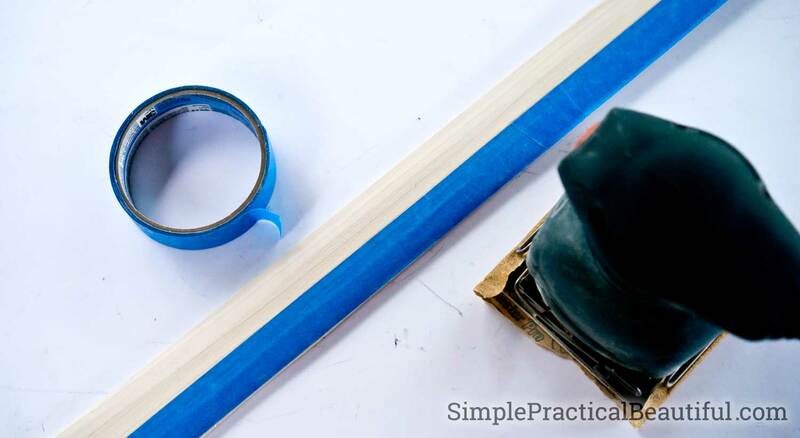 Put blue painters tape with the edge down the middle of the blade. Then sand the wood to knock off the square edge of the blade till it is half way along edge. Flip the blade over and do the same on the other side. I found the blue tape helped prevent sanding down other side so I could get a ridge down the middle of the blade. Don’t sand between section “G” and “F”. 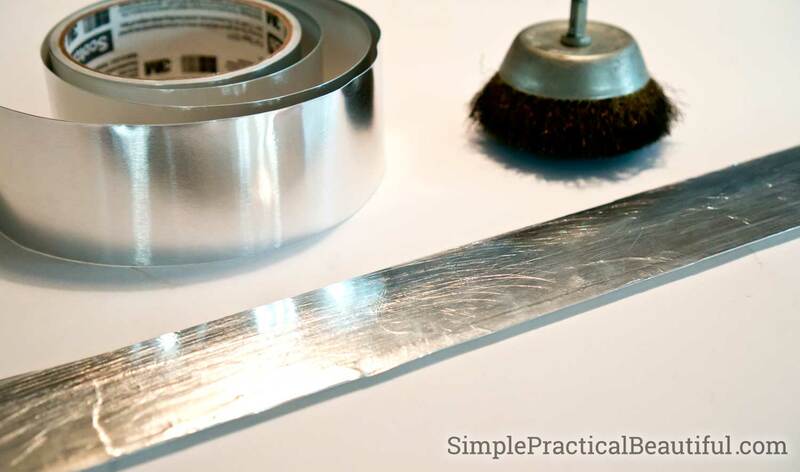 Use aluminum foil tape and apply it over the edge of the blade. This doesn’t have to be perfect but just cover all the parts of the wood. This makes the wood look metal. 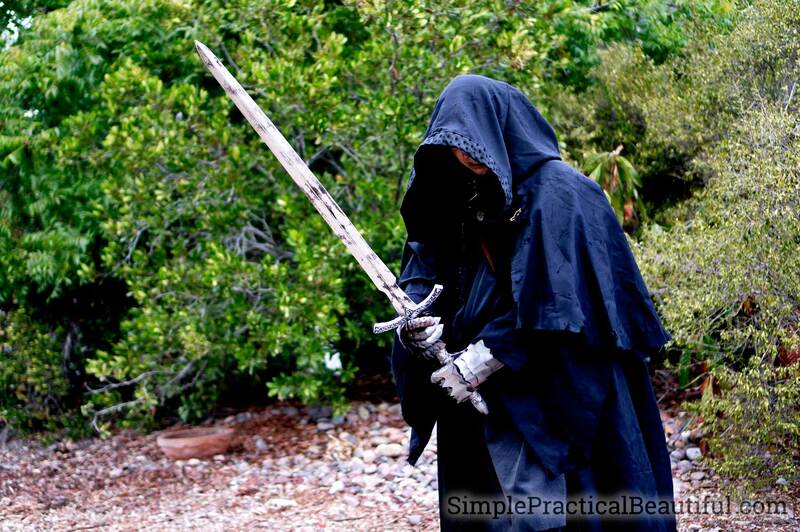 The blade with aluminum foil tape was very shiny and didn’t look right with my Nazgul costume. So I decided to us a wire brush to scratch up the blade. This added a lot of cool texture to the blade. 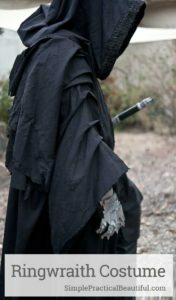 The Blade still was too bright so I sprayed it with a light coat of black spray paint and wiped it down with steel wool. This wiped off the top layers of paint but kept some of the darker areas in the scratches. Cut the wood for the crossguard into 2 pieces that are 2 inches by 9.5 inches. Also cut two additional filler pieces that are 3.25 inches by 2 inches. 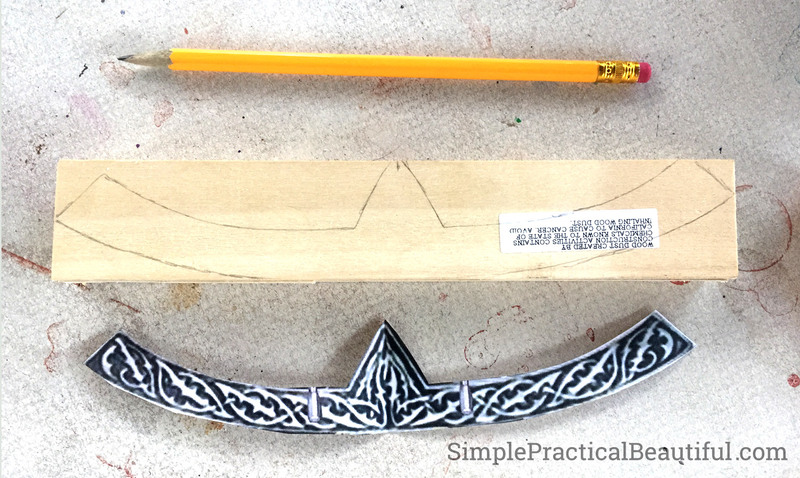 Trace the template for the crossguard onto one of the longer piece of wood. Then place the other crossguard piece down on table and glue the two filler pieces on the outside edges. There should be enough space for the blade to fit snuggly between the filler pieces (Don’t glue blade yet). Then glue the second cross guard piece (with template drawn on it) on top the other parts. Then clamp all of the parts together and let it dry overnight. Once the glue is dry, cut along lines drawn on the Crossguard. Again, I used a bandsaw to cut. Once the shape is cut, sand the edges and face of wood until it is smooth. 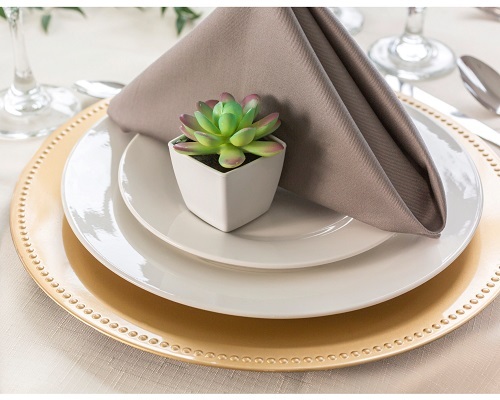 Using a glue gun, apply a bead around the edge of cross guard to create a design. Do this on both sides of the cross guard. Then spray paint a base coat of black spray paint over both sides. 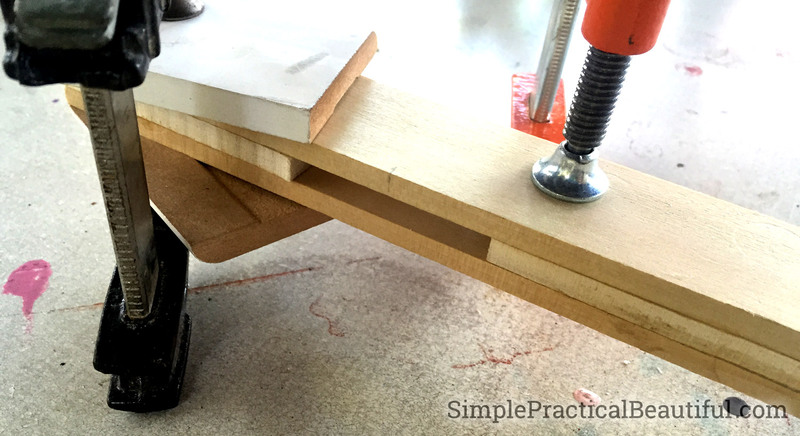 Cut the 2-inch round dowel to 14 inches long. 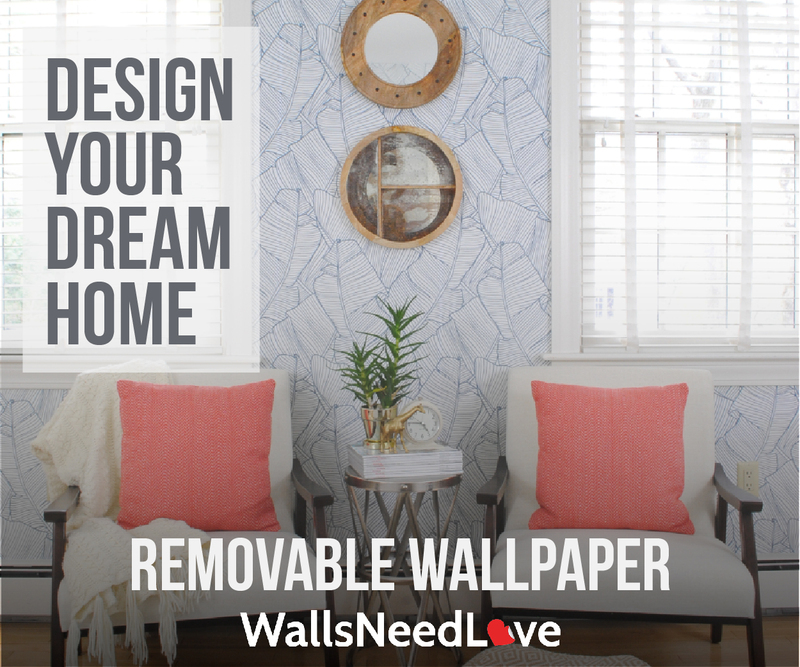 Using a Dremel, sand paper, or a lathe, carve the dowel to be the shape of the template. Then sand to finish edges. 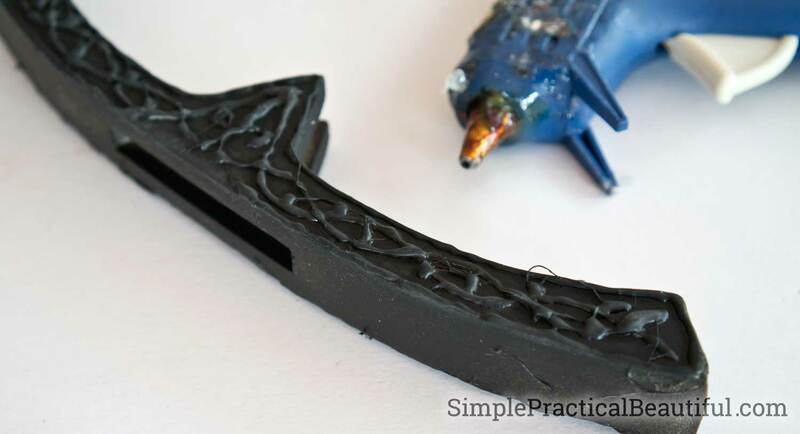 Then apply hot glue around section “E and A” of the grip and pommel to create a decorative design. Then apply a layer of black spray paint as a base coat. Cut a notch in the top of the handle so that it slips over the crossguard. Next slip the blade through the hole in the crossguard and use wood glue to attach. 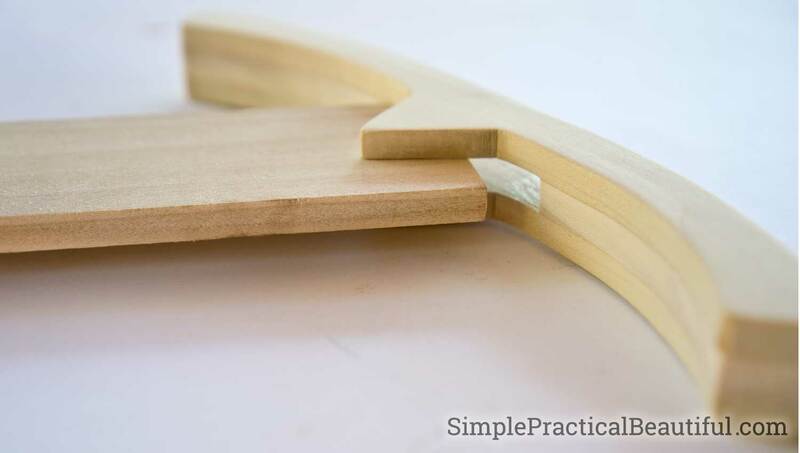 Then slide the notch of the handle over the crossguard and use wood glue to connect these parts. 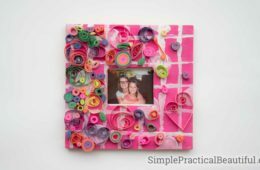 Clamp everything and let it dry overnight. Now the part I really love. 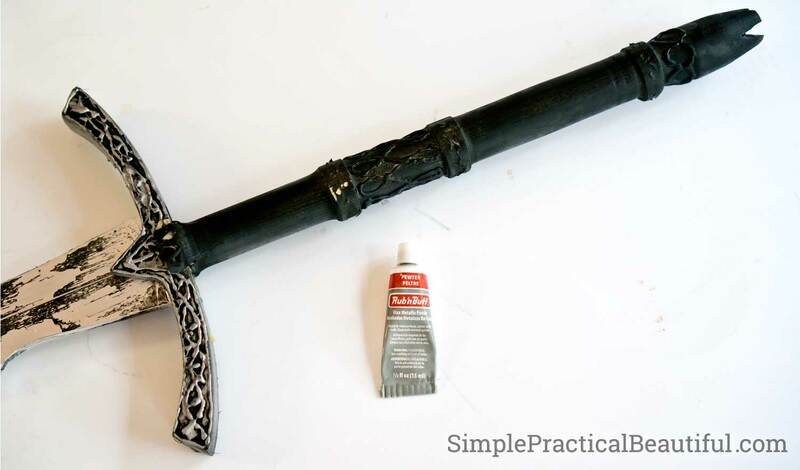 Apply Rub and Buff in pewter or silver to the top edges of the hot glue gun bead on the crossguard and handle. 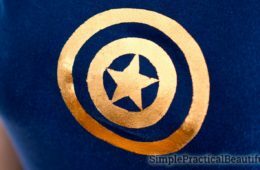 The best way to make Rub and Buff work is to apply it with your finger then rub over it with a cloth to make the metal shine. 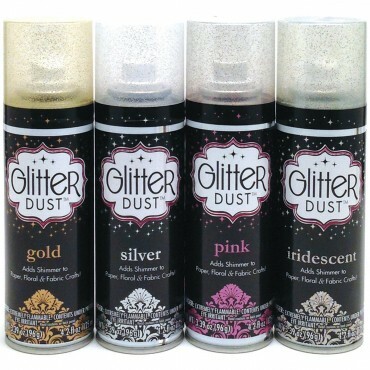 That’s where the name comes from, first you “rub” it on, then you “buff” it to a shine. 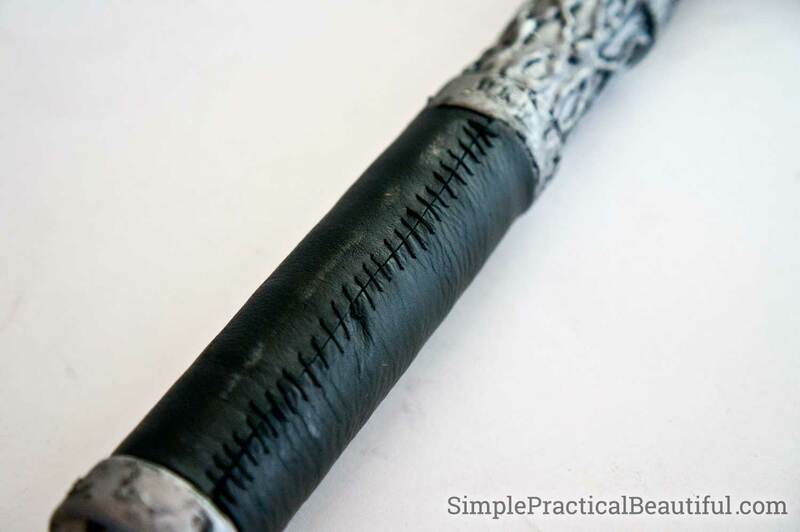 Using paper, measure around section “B” & “D” and cut a paper templet for both areas to wrap leather around the grip. 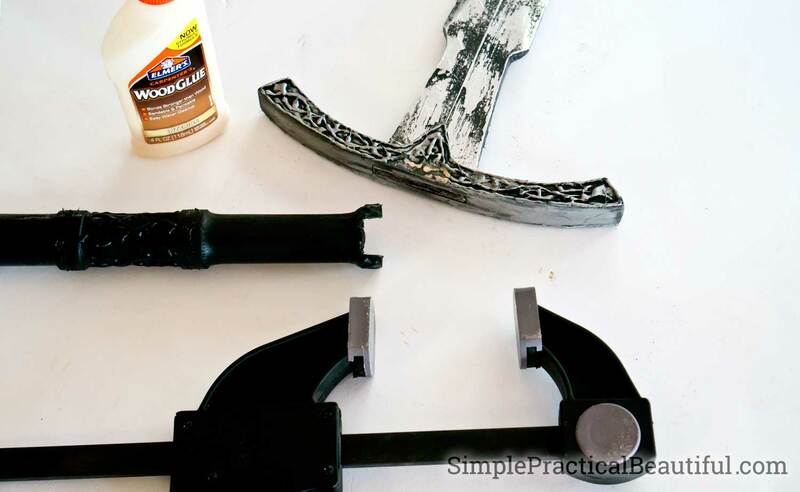 Use the template you just made to trace black leather and cut it out. Then wrap electrical tape around section “B” and “D” so the sticky side is out. 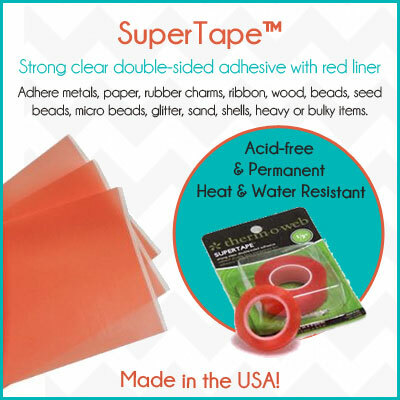 This will help your leather to stick to the grip area. Then using some thread sew the edges of the leather to the grip. This photo shows a close-up of the finished sword hilt so you can see all three parts assembled together and finished. 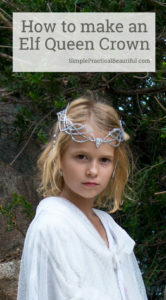 Click here to see the full Nagul or Ringwraith costume. 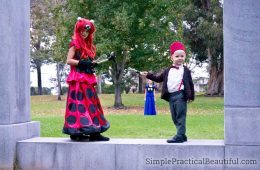 You can read how to make the cloak here and how to make the gauntlets out of foam here. 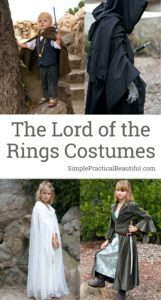 Plus, don’t forget to check out all of our other Lord of the Rings costumes here. 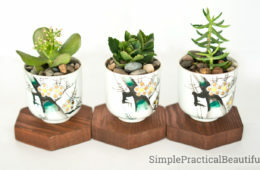 Such a great idea and something I would love to do also! Great job Rebecca! What thickness of wood did you use? 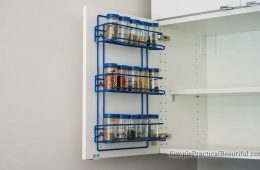 I’d love to try making this but didn’t see that part in the instructions, only the length. What thickness of wood did you use? I didn’t see that in the instructions. This looks awesome! Thanks. The wood is 1/4 inch thick. 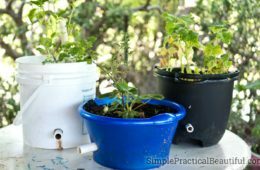 I came across this DIY on Pinterest and was in love the moment I saw it. 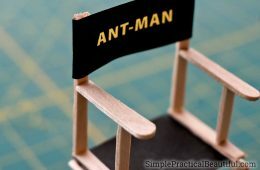 I was amazed by how simple it was and how little resources there were required, yet it looked so incredibly realistic. I couldn’t wait to start making my own. Because I am obsessed with dark fantasy, vampires and everything creepy, I decided to make a sword worthy of Count Dracula himself. You can see my progress and the final result in the imgur album below! We did some things differently, but I think the final result turned out really great, if I do say so myself, especially if you consider this was my first time doing anything with woodworking. Thanks again for this amazing tutorial! 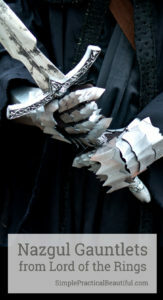 I can’t wait to show my Vampiric Blade off on cons and renaissance fairs! The aluminum foil tape trick is amazing. Also love all the distressing you did. Your sword looks amazing!